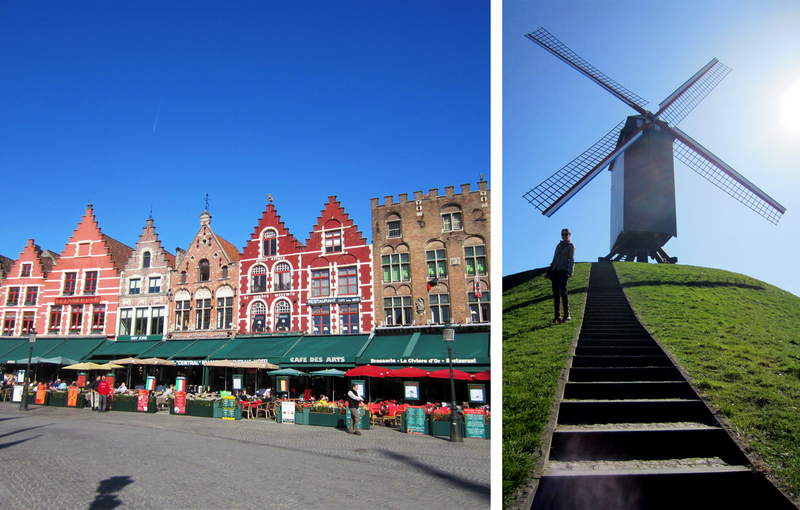 There are 2 things you need to know about visiting Belgium. One, because of its location situated between France and Northern Europe, there is a language difference from the north to the south. Whereas the southern half of Belgium (including Brussels, the most well-known city and home of the European Union) speaks French, the Northern half speaks Dutch or one of its many dialects like Flemish. And two, make sure you bring your appetite. Both of these points were very apparent to me in Bruges (pronounced “broozh” in French), a storybook city, dotted with windmills, little shops and canals running through it, hence its nickname the “Venice of the North” (you may also see the city’s name spelled Brugge, pronounced “BROO-ghah” in Flemish). Immediately after stepping off the train from France, I knew right away that I was in an entirely different place. The fact that I could no longer understand the signs was a dead giveaway. But just because I couldn’t speak or read Flemish, didn’t mean I couldn’t sample some of the local specialties. So with only 4 hours in Bruges before heading off to Brussels, here’s a snapshot of how I spent my time eating my way through this absolutely adorable city. 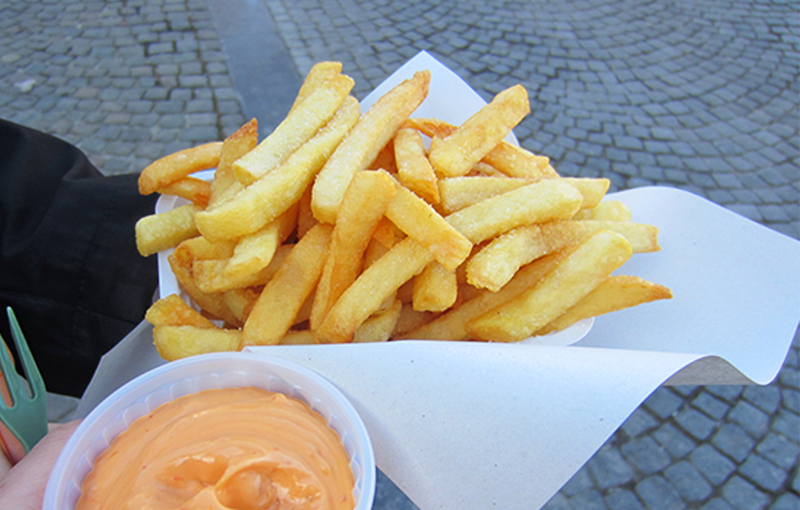 Even if you don’t typically indulge in fried foods, you have to try frites. These fries are deep-fried twice – once to cook the potato and once to brown – so the result is fluffy on the inside, yet crispy on the outside. Whatever you do, don’t order ketchup (you’ll mark yourself as a tourist instantly – I had to elbow my husband on this one), but rather try one of the more traditional mayonnaise-based sauces. The best place to enjoy this snack is from the little green stands in front of the bell tower on Market Square. 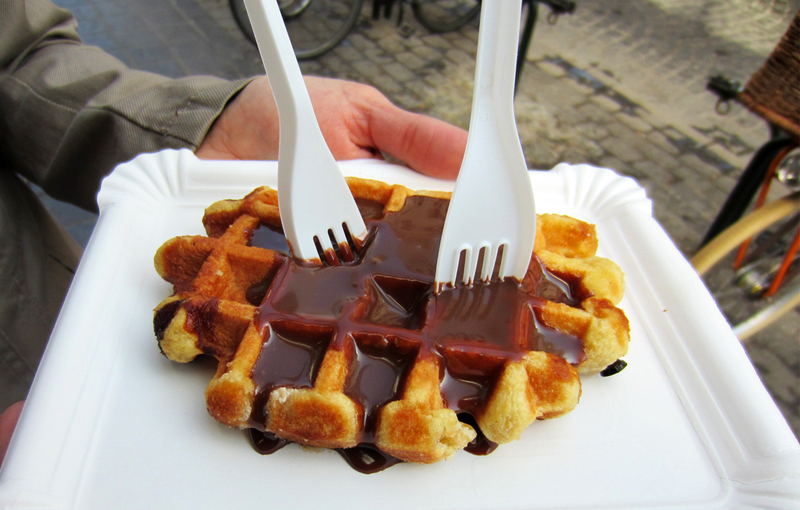 Belgian waffles, or gaufres, are much denser and sweeter than what we’re used to in the U.S. This trademark treat can be bought in small shops or carts throughout the city, with your choice of a variety of toppings like mounds of whipped cream, fresh fruit or simply just chocolate sauce. Speaking of, the Belgians are known for their chocolate for a reason – it’s amazing. 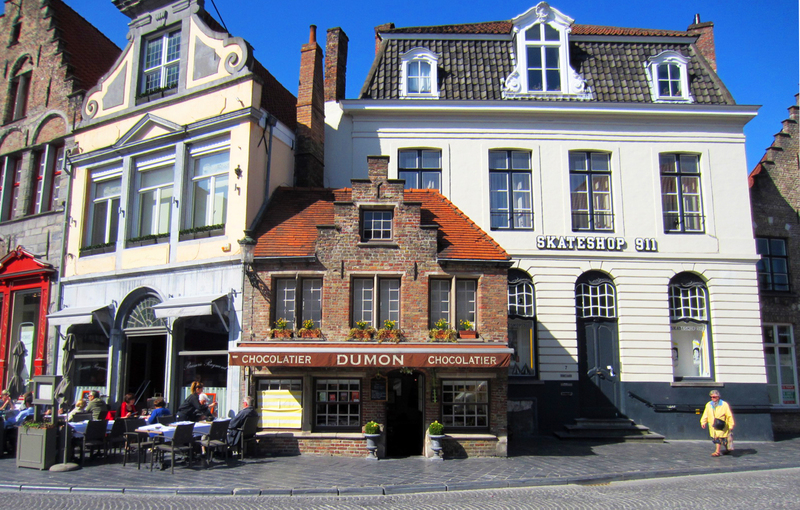 Big companies like Godiva and Neuhaus date back to 19th century, but hands down, the best chocolate I’ve ever tasted was from a little family-run shop called Dumon in Bruges. I was lucky enough to be helped by Madam Dumon herself, who cheerfully boasted about how her son makes the chocolates fresh every morning, and wished my family a “Happy Easter” as she sent me on my way with a box of assorted chocolates. Last but not least, there’s no better way to kick back and reflect on the day than with a Belgian beer. With literally hundreds of varieties, you’re bound to find something you’ll enjoy. 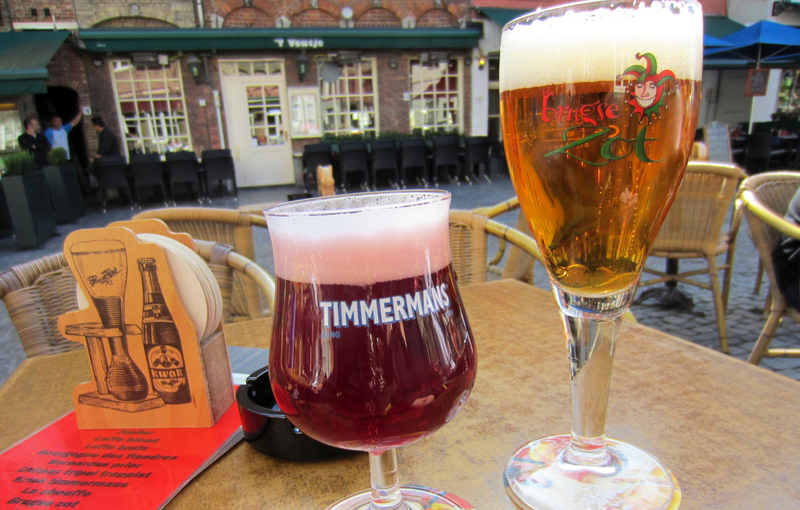 Even if you’re a non-beer drinker like me, there’s something for you too – try a lambic. These fruity beers are closer to a hard cider than traditional beer, and can be found in a variety of flavors like kriek (cherry), frambozen (raspberry) or pêche (peach). 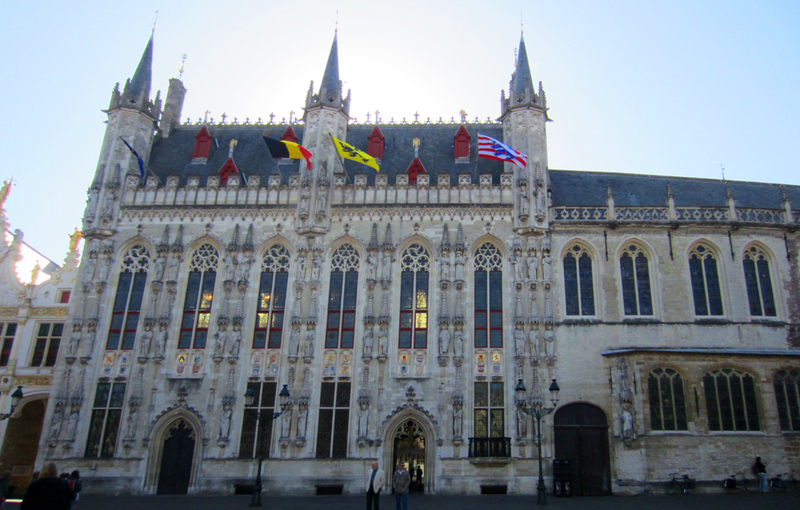 It’s amazing how fast 4 hours in Bruges flew by, which makes me wonder how much more I could see, do and of course eat with even more time – all good reasons for a return visit.